To read the full West Hawaii Today article, “Kona Hospital Foundation Receives $3K,” dated January 11, 2017, click here. 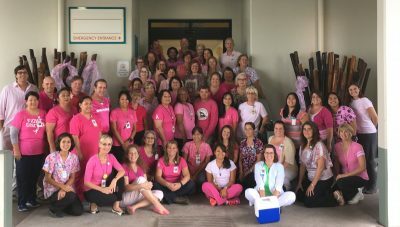 On Friday, October 7, Kona Community Hospital employees dressed in p ink attire to recognize Breast Cancer Awareness Month. Wearing pink in October has gained popularity as support for breast cancer awareness and to encourage early detection. “This annual event gives employees and hospital staff an opportunity to raise awareness of breast cancer, which affects so many people,” said Judy Donovan, KCH Marketing Director. 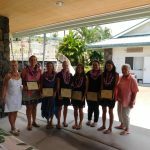 On Saturday, August 27, the Kona Community Hospital Auxiliary awarded $12,0 00 in nursing scholarships to six local students seeking to pursue nursing careers. The Kona Community Hospital Auxiliary nursing scholarship program annually awards up to $2000 to each recipient. This year’s scholarship recipients included Melissa Moats, Michelle Proue, Jacqueline Sanders, Joy Woods, Ellie Kalawe and Shaylynn Fujii. To be considered for the Auxiliary’s nursing scholarship, applicants must submit a resume, school transcripts, two letters of recommendation and a personal essay on why nursing was chosen as a career. In addition, students must already be accepted to a nursing school. 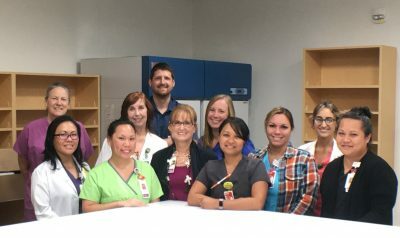 The Auxiliary’s goal is to provide financial assistance to nursing students, and to aide Kona Community Hospital in meeting its future nursing needs. The KCH Auxiliary is the largest volunteer organization at the hospital. There are numerous volunteer opportunities within the hospital. They also operate the hospital Gift Shop. Monies for nursing scholarships are generated by the Auxiliary’s Friday Bake Sale, their annual Art at the Pavilion event as well as other activities. To be a volunteer or to donate to the nursing scholarship fund, contact the Auxiliary office at 322-4577 or visit the KCH Auxiliary website.